Potential anti-androgen and anti-inflammatory properties suggested for the benefits of pumpkin seed to the prostate in a report published in Reviews in Urology. Lycopene - A beneficial role for lycopene has been suggested in patients diagnosed with benign prostate hyperplasia. A pilot study for BPH showed those taking lycopene showed no further enlargement of the prostate. Prostate support has a combination of nutrients, including Selenium and Lycopene, which may aid in the maintenance of a healthy prostate. Prostate symptoms frequently cause discomfort among men particularly those over 50.Note: It is important to seek medical confirmation for your symptoms. Differential diagnosis for Prostatitis, an inflammation of the prostate, and cancer of the prostate gland should be carried out by a medically qualified practitioner. Stinging nettle root (UrticaDioica) - Further studies have shown that there are a variety of well known compounds present including betasitosterol, quercetin and rutin. Inhibitory and anti-proliferative activity of UrticaDioica has been recorded in research for human prostate tissue. Beta sitosterol which is found naturally in a plant called sterol. 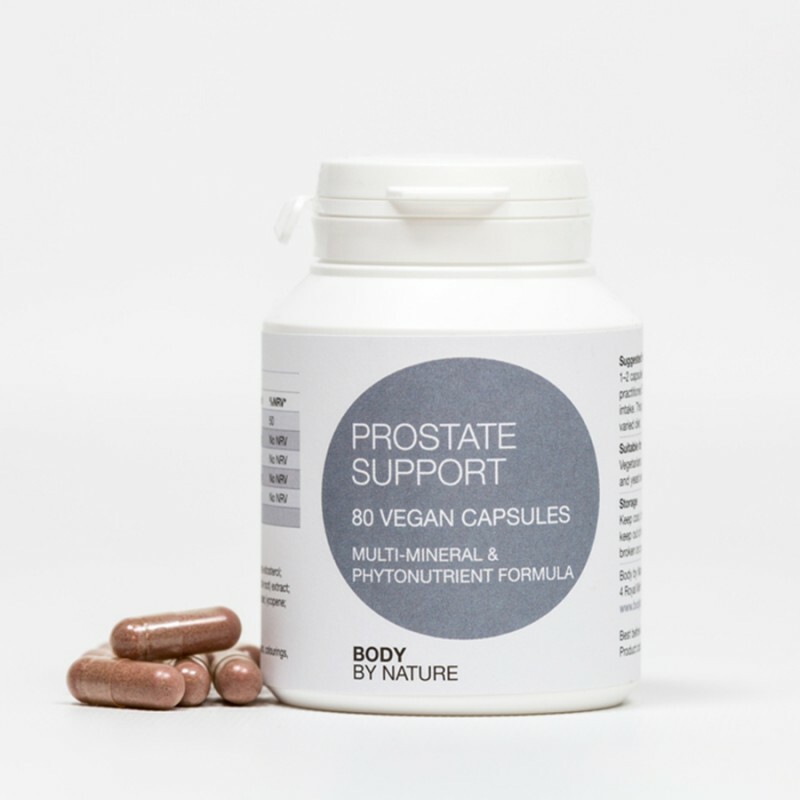 A pilot study for BPH showed those taking lycopene showed no further enlargement of the prostate, whilst those in the placebo group demonstrated a continuing enlargement. Zinc - is an essential mineral. Zinc deficiency affects about two billion people in the developing world and is associated with many diseases. Reports have suggested that zinc may help in regulating both cell growth and apoptosis. Body by Nature Whole-food supplements are made fromminerals that have been hydroponically-grown into a cruciferous vegetable (brassica) that is a member of the same family as broccoli The brassica base also contains additional nutrients and acts as a food base to aid absorption of and metabolism of the nutrients. Capsule shell (hydroxypropylmethylcellulose); beta sitosterol, pumpkin seed extract, urtica dioica (stinging nettle root) extract, brassica juncea providing a wholefood mineral base; lycopene; zinc citrate. Wheat; yeast, starch, gluten; lactose; added sugars, colourings, flavourings and preservatives.